Jesus Calling: An Innovative Way to Sense God or a Dangerous Practice? on my desk where it had not been moved in a week and asked, "
That’s a beautiful book, may I have it?" She later told me that she was quite uncomfortable with the book and began to read the sections to me that bothered her. teachers and the originators of many cults. on “experience” in her encountering the presence of God. an appetite for it, making it a best seller. Scripture must drive a person’s life and so in reading her “personal testimony” it appears other things were driving her fulfillment. Just the fact that she was working at a counseling center in Atlanta when she should have been a “worker at home” (Titus 2) helps me understand why she was so disenchanted in her relationship with Christ. I wonder if she ever considered the fact that maybe what was missing in her life was not some experiential encounter with Jesus but the daily encounter of being with her children throughout the day and the fulfillment that being in the center of God’s will brings. So I am not surprised when she writes that “not once during those sixteen years did I vividly experience the Presence of Jesus” (ix) and that when she quit her job to prepare for their move overseas she “was adjusting to the loss of my fulfilling work as a counselor” (x). When we ignore God’s plan and God’s design for the family there will always be burn out and a void in the human spirit. We will never find real fulfillment until the Holy Spirit dominates us as He fills us according to the dictates of God’s will found in God’s Word. 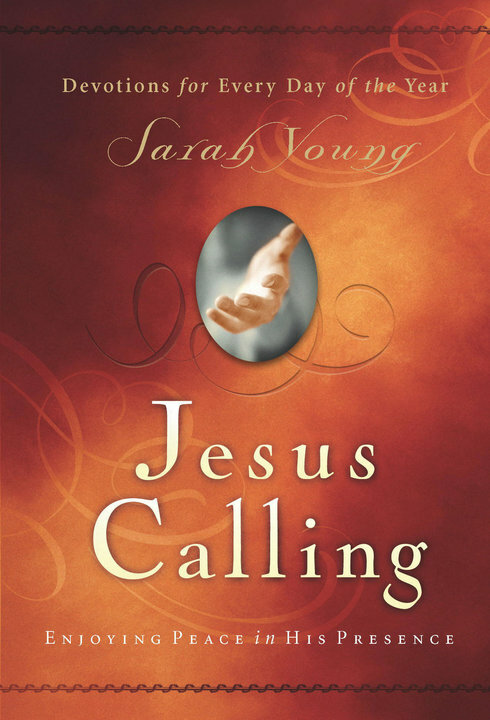 For those of you who have read Young’s introduction, you know that a turning point in her life was when she read a book written by two unnamed women titled, God’s Calling. These women say they “practiced waiting quietly in God’s Presence, pencils and paper in hand, recording the messages they received from Him,” with these messages “written in the first person with ‘I’ designating God” (xi). With that methodology learned from these women established, Sarah Young has now given us the “messages” she has received from God as her time with God has moved from a “monologue” to a “dialogue” (xii). To summarize her time with God Young writes, “This new way of communicating with God became the high point of my day. I knew these writings were not inspired as Scripture is, but they were helping me grow closer to God” (xii). The purpose of Young’s devotional Jesus Calling is to, “share some of the messages I have received. . . . I have written them from Jesus’ point of view’ i.e., the first person singular (I, Me, Mine) always refer to Christ. ‘You’ refers to you, the reader, so the perspective is that of Jesus speaking to you” (xiii.). These statements alone should be enough to make the, “mature who because of practice have their senses trained to discern good and evil” (Hebrews 5:14) throw the book in the wastebasket! But unfortunately, largely due to weak pulpits and immature believers, the modern church has an appetite for such experience-driven dangerous writing. When Sarah Young writes, “I knew that God communicated with me through the Bible, but I yearned for more” (xii) what she is really saying is that the Scriptures are not sufficient. Granted, to her credit, while Young affirms, “The Bible is, of course, the only inerrant Word of God” (xiii) in practice she is saying that the Scriptures are really not enough. That great pastor James Montgomery Boice (now enjoying the presence of His Savior in heaven) taught in his classic work, The Preacher and God’s Word, that the real battle in our times would not be the reliability of Scripture but rather the sufficiency of the Scripture. I believe that the current decline in Bible exposition goes hand in hand with a belief that while the Bible is infallible and inerrant, it is not enough. So today in Bible-believing churches we prop up our services with skits, entertainment, and short feel-good sermons. This is precisely what Young’s book reflects - - that the Scriptures are not sufficient - - that we need more. So I am not surprised that she tells us that we need to be waiting with pen in hand to listen for a message directly from God. 30:6; Revelation 22:18-19). I believe the Bible is the only “voice” to which I should be listening. Her devotional approach to meeting with God is only setting the stage for gross error to walk through the front door of an already anemic evangelical church. Twenty-five years ago her book would not have been a best seller amongst evangelical Christians. It would have received severe criticism and I can promise you that Thomas Nelson would never have published it. In years past, the Body of Christ would pore over their Bibles looking to the Holy Spirit to illuminate the Scripture He had given to make us adequate “for every good work” (2 Timothy 3:16-17). When the Apostle Paul prayed for the Ephesians he did not pray that we would listen for some message from Jesus but that, “the eyes of your heart may be enlightened, so that you may know what is the hope of His calling, what are the riches of the glory of His inheritance in the saints, and what is the surpassing greatness of His power toward us who believe” (Ephesians 1:18-19). The church today needs to be discovering the spiritual riches that God has already blessed us with in Christ Jesus not looking and listening for some new or additional impression from God. But anemic Christians who do not study the Scriptures diligently, who do not search the Scriptures like someone yearning to find gold, who are driven by the sensual rather than by the spiritual, will be quick to adopt Young’s methodology. There is so much more I could say and I have not even commented beyond her introduction. I have never met this woman and have never heard of her before I was given this book. I doubt if I interviewed her that I would find gaping holes in her theology. But this concept of teaching that we should with pen and paper in hand be ready to receive direct messages from Christ is very disconcerting. She is encouraging a dangerous practice and doing a great disservice to the Body of Christ. I could never ever recommend this book or any book that mimics its practice. Jesus Calling and its predecessor God Calling are, in their own way, very dangerous books. Though the theology in Jesus Calling is for the most part consistent with historical Christian theology, my great concern is that it teaches a methodology of meeting with God that is anti-Scriptural. To present as normative hearing words directly from Jesus and then sharing these words with others is something the cults have always been known for, not evangelical Christians. To elevate one’s experience over the authority of Scripture is a dangerous methodology to teach. I think of all the young immature Christians who will be given this book to their spiritual detriment. And it is so sad that so many so-called ‘mature Christians’ are enamored with this work. If I did not believe in the sovereignty of God over His Church, books like this would make me despair as a pastor. I could never possibly recommend this book.